The story is true but the names have been changed to protect the innocent. You have to love the creativity of the scrolling community. I received this picture form Jim. His girlfriend was giving him a hard time about his old ripped and torn jeans. She wanted them gone! The horror! You know losing a pair of jeans that you have finally broke in, is like losing your best friend. It doesn't rise to the level of blowing out your best Converse Chuck Taylors that you bought in 1977 but it's bad. It's a guy thing that most women just can't comprehend. So faced with this unthinkable loss Jim jumped to action with a pair of rusty scissors he found in his tackle box. You know that prized Craftsman screw driver your dad gave you when you turned twenty one? The one that has the lifetime warranty so you hate to throw it out even though you mostly just use it to open paint cans. Guess what? It fits perfectly in the Levi Coin Pocket Hang Up. You heard me right. From one pair of Levis you get four full size Levi Hang Up's and Two Levi mini Hang Ups for the low price of nada. For those of you living outside the city of New York that means free. Thanks Jim for the great tip. I suggest you buy the domain name www.levihangups.com before it's too late. I had to share this intarsia portrait with you guys. Bob has been a reader of my blog for a long time. He lives in Australia and is one of the most talented craftsman I have ever seen. 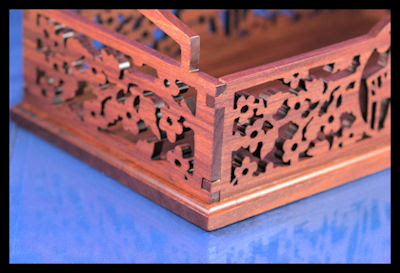 I say craftsman because his skill is much more than just woodworking. He has that unique gift of being able to build just about anything he sets his mind to. Just ask the other scrollers in the clubs he attends. They will tell you how often Bob comes up with something new and amazing. 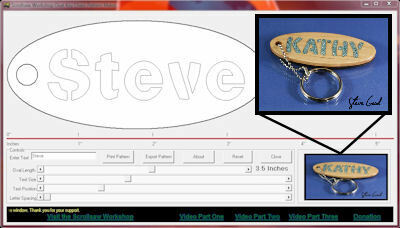 Bob decided to make a couple intarsia portraits so he set down with Corel Draw and designed this pattern. He does not have a lot of experience with Draw but you could not prove it from this work. Make sure you click to enlarge the picture to see the detail. The body is Black wood. The beard is paper bark. The face is wild cherry. The eyebrows and pupils are marboo. The whites of the eyes are poplar. The hat is blackwood. 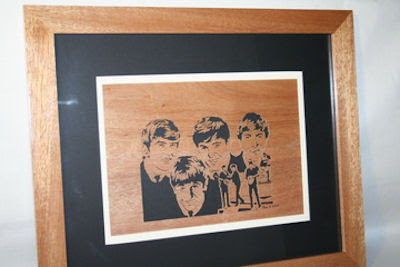 The background is poplar and the frame is blackwood. Bob finished the portrait with water based lacquer. Bob estimate he spent about a week and a half of long days to complete the project. The thing I like so much about this project is not the fact that the likeness is so remarkable but the fact that it shows the character and spirit of the man. You look at the portrait and you feel you have met Bob someplace. Thanks for sharing with us Bob. As usual I am humbled by your work. 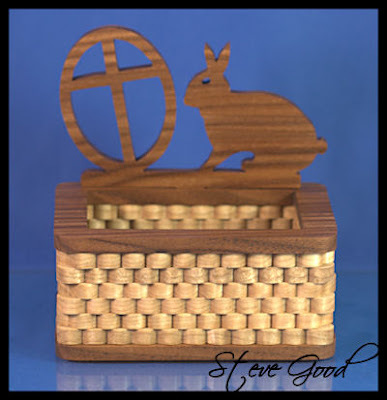 This small basket is a fun and quick project. 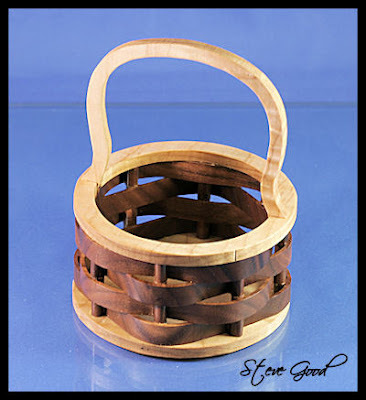 I have seen this type of basket sold in the Artique store for $50. I used the weave technique for this pattern. It is a pretty effective illusion of a weave. I suggest that you stack cut the weave to speed the project up. We have a winner. 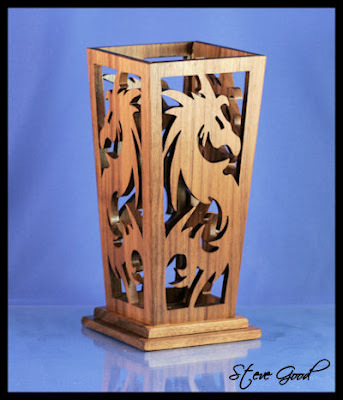 Roger form Saltspring Island was the first to submit a picture of the dragon vase pattern with 8 sides. 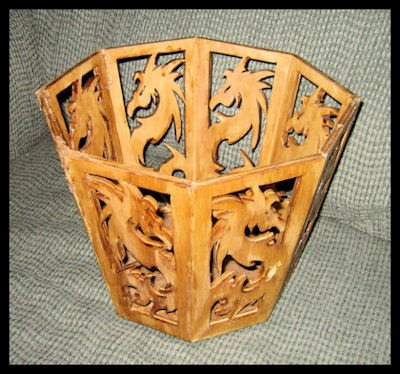 A few days ago I put out a challenge for a $20 Amazon gift certificate for the first picture of my Dragon vase pattern with 8 sides. It did not take Roger long to complete the challenge. Congratulations and enjoy the certificate. Ladies, how many times have you heard your husband say "When I get around to it."? Well the next time be prepared with this official Round Tuit. Upon receipt of this legally binding medallion your husband is obligated by penalty of law to complete said task immediately. Failure to discharge the duties in the prescribed time may result in legal action including fine, imprisonment and/or a trip to the mall. this is another project to help clear out that scrap wood bin. Stack cut this project and have a supply on hand for husbands, children, contractors and work mates. I updated the free pattern catalog tonight. I added the last 42 free patterns to the page. If you have visited the catalog page before make sure you refresh the page to ensure you are seeing the latest update. Click this image to go the the catalog. If your connection is slow it will take a while to load. Be patient. 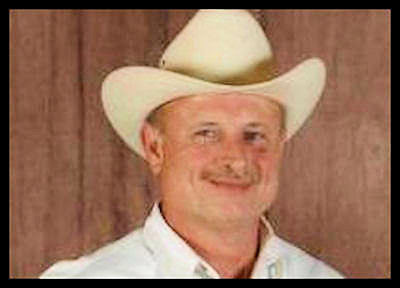 Gary Allen is an Assistant Fire Chief for Eastman Chemical Company. After years as a fireman he had accumulated many fireman's patches. About three years ago Gary decided to make a Fireman's Maltese Cross and frame it along with all his patches. A new hobby was born. He has been scrolling every since. 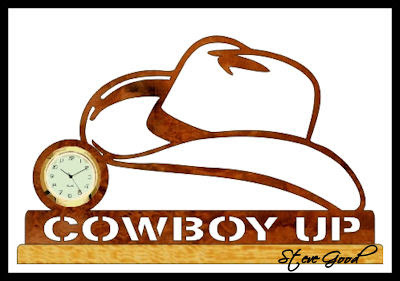 Gary lives in Longview Texas where his father is also a woodworker and a valuable resource. One of Gary's work mates, Phil Peoples is also a talented scroll saw artist and his imagination with the saw has been an inspiration to Gary. Gary was recently recovering from total knee replacement surgery. During his time off he was able to spend more time in his shop. The pictures below show that he put the time to good use. 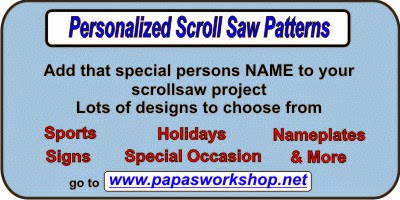 Gary's wife purchased him a Craftsman 16" variable speed saw as a present. He has received a lot of pleasure from the gift but plans to upgrade the saw soon. 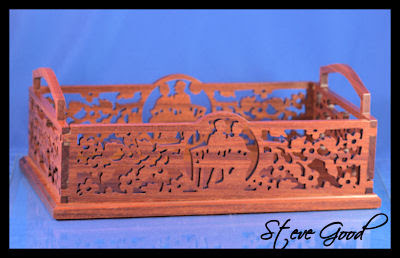 Thanks Gary for sharing your story and beautiful projects with my readers and myself. If you would like to share your work with the world just email me a picture of yourself and a short bio. Include a few pictures of your work. If you have a website that you would like to plug that's fine also. This is a very easy pattern to cut but a bit tougher to assemble. The vase is tapered top to bottom and the sides are cut on a 45 degree angle. This compound cut can be a challenge for new woodworkers. You can use a table saw to cut the 45's or you can do what I did and sand the 45's after the pieces were scrolled. I set the table on my table top sander to 45 degrees and slowly sanded the sides until I had a sharp 45 angle. This is not the most accurate way to do it but with care you can get pretty good results. The next challenge is to clamp the glued sides together. I lay the pieces down on blue painters tape with the 45's up. Then apply glue to the joints and fold the sides together. Use the tape to hold everything together until it dries. A few rubber bands come in handy also. Sorry I didn't take pictures of the assembly. If you have trouble let me know and I'll mock up some pictures to help. I have a challenge for you that should be fun. 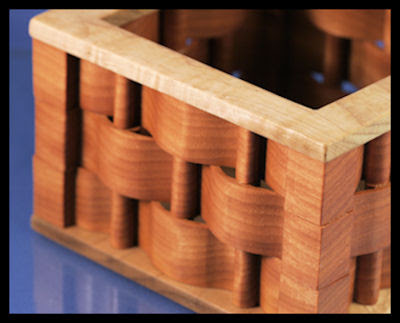 Make a vase from the pattern with 8 sides. The angle will change to 22.5 degrees and the assembly will be twice the fun. Any takers? 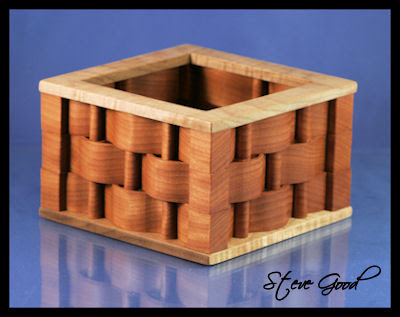 The first picture I get in an email of this pattern with 8 sides neatly glued up and finished will get you a $20 Amazon gift certificate. I will publish the winning picture on the blog for the whole world to see. As many of you know Hawk manufacturing has gone out of business. 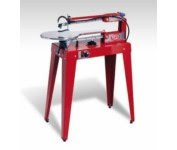 Hawk made a high end series of scroll saws as well as other fine woodworking machinery. For those interested here is a link to the liquidation auction. I notice that there is no inventory included in the auction. I had a request for this pattern. 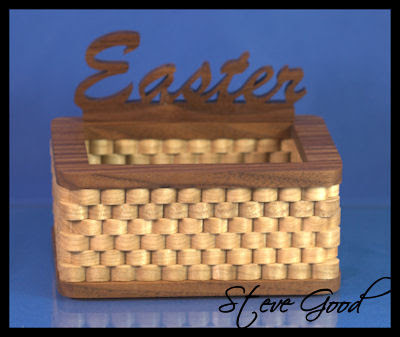 Darrell found a picture of a similar basket and wanted to know if I could design something similar. I came up with this pattern tonight and thought others might like it also. 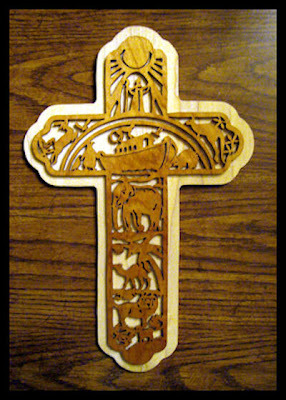 When you show this project people will ask how you could cut this from wood. It has a very convincing weave look. 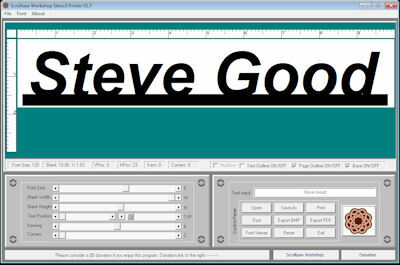 The pattern is not too difficult but it might be a little tough for a first project. The weave can get a little delicate as you cut. If you want to give it a try just go slow and you should do fine. I included two different size patterns. A 5" square and a 6" square. 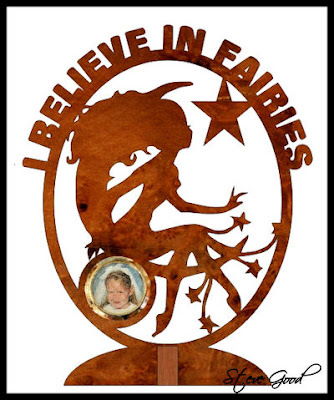 Any little girl would love to have this photo frame sitting in their room. 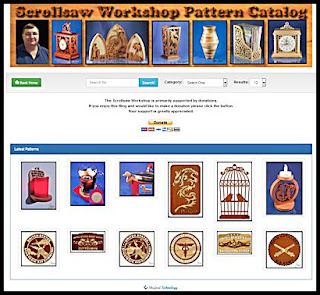 If you want to make a gift for your granddaughter or daughter give this project a try. This pattern is cut from 1/2" Thick stock. It requires a 1 7/16" mini photo insert. 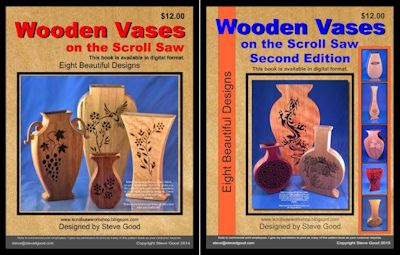 The inserts can be purchased online at Sloan's Woodshop. Look under their "Clock Inserts". 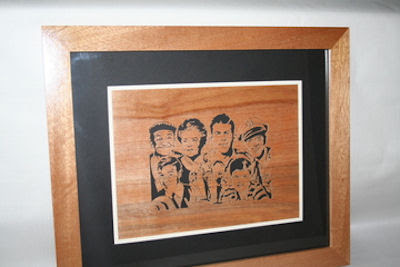 Sloan's has been in the business of selling scroll saw merchandise for years. 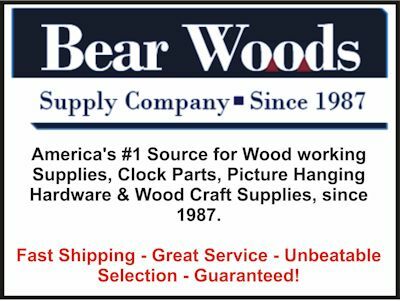 If you are looking for a reliable online supplier make sure you check them out. 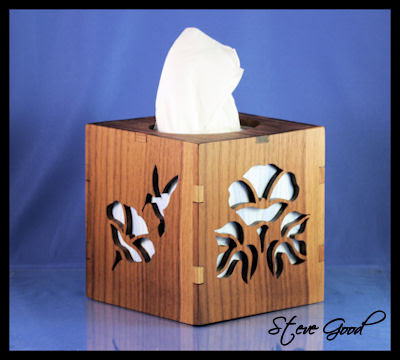 Tissue Box Cover Scroll Saw Pattern. Just in time for flu season. This tissue box cover pattern is constructed with 1/4" stock. 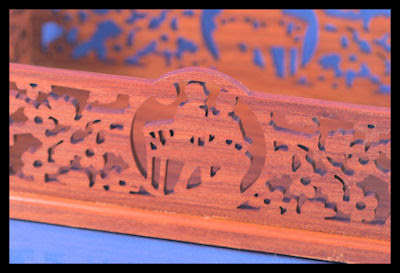 The design is easy to cut but you will need to be accurate when you cut the box joints for a good fit. The box is bottomless and just slides down over the tissue box. 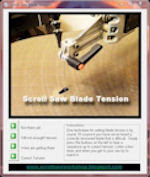 The front and back are identical as well as the sides so stack cutting can be used to speed up the cutting. 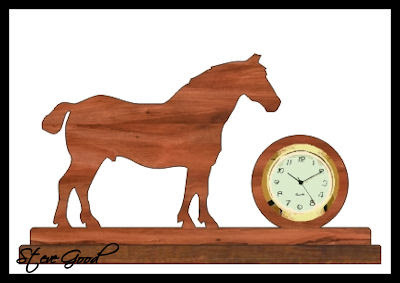 Here is a pattern book with six equestrian mini clock patterns. 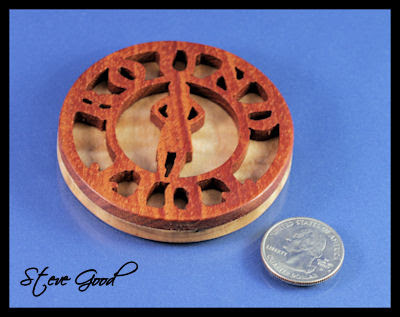 Each pattern requires a 1 7/16" mini clock insert. Reader Spotlight. Meet Darrell Cheeks. Darrell puts a whole new meaning to the word dedication. He wakes at 2am every morning to spend five uninterrupted hours in his shop. 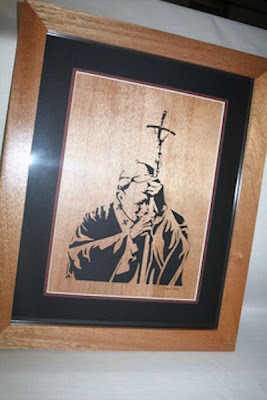 He spends that time between his two hobbies of scrolling and his CNC router. Then he heads off to to work for nine hours. Darrell says "Yup, I get five hours sleep per night". He loves to design his own patterns as well cut patterns from other designers. Darrell lives in West Columbia South Carolina. 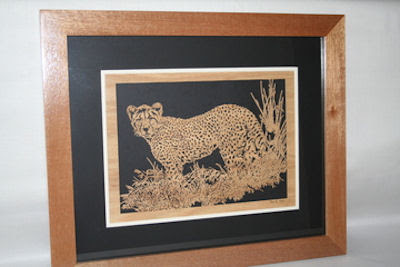 He has been producing beautiful scroll saw art for four years with his 18" Delta Q3 scroll saw. 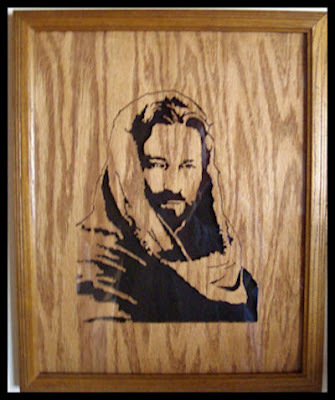 You can see the web site where he presents his pieces at Wood Med Studio. Stop by his site and take a look around. Make sure you check out his sports themed pieces. 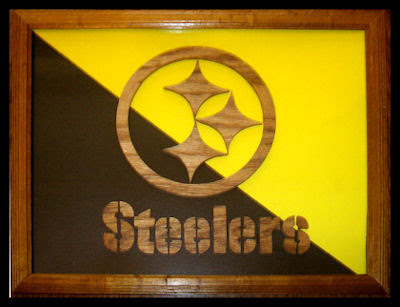 If you have a sports fanatic in your life these would make a great gift idea. 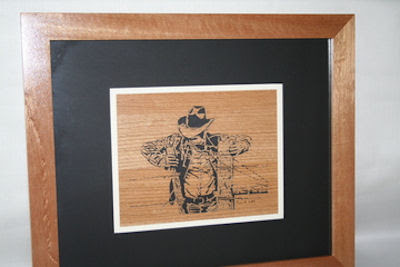 He has an Order/Contact tab where you can say hi and place an order for his work. 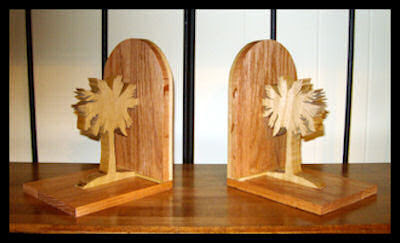 The pictures below are but a few of the wonderful projects Darrell has made. 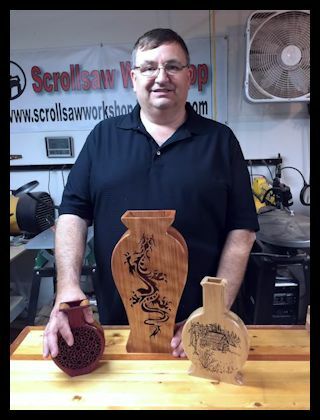 If you would like to have your work featured at the Scrollsaw Workshop please email 3 or 4 pictures including a picture of yourself along with a short bio. It's fine to promote your website if you like. Next time funds are low and you want to get in the shop and make something try this pattern. 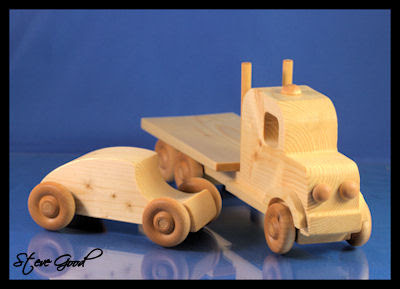 Build this car and truck from a construction grade 2 x 4. 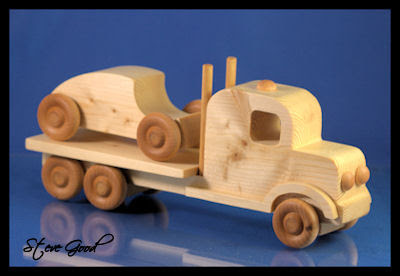 A couple hours work and a few bucks will build a fun toy for a child. Building toys for children is fun but there is a responsibility to make sure the child is old enough to play safely with the toy. This toy project is not appropriate for children that will put small object in their mouth. 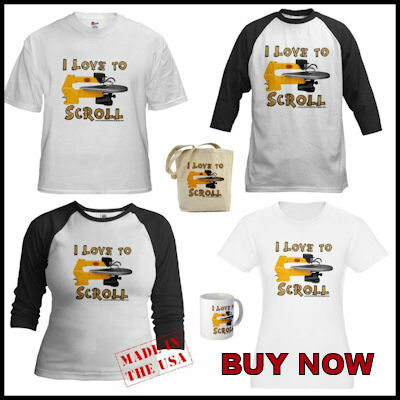 If you are viewing this from the email newsletter you may not see the included video. 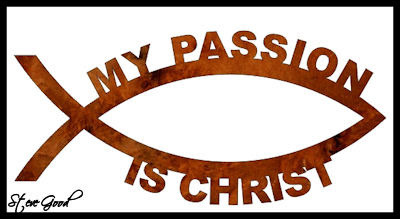 Please visit my blog and look for the video in the daily posts. You have heard me talk about this great group of scrollers before. Here is another video showing how these men and women make a difference in the lives of families that have lost their hero. If you receive this through the email newsletter you may not be able to view the video. Just visit my blog and you can watch the video in the daily post section.